Posted on October 30, 2014 by Lisa Johnson, Ph.D.
A cursory review of publications about online learning will provide you with plenty of information about the variety of methods for designing, implementing, and evaluating online discussions and reasons for the use of discussions as an assessment strategy. This is not intended to be an exhaustive review of why universities require online discussions. Instead, it is intended to offer a research-based introduction to primary reasons why the requirement exists by drawing on some key literature from the field of online learning and asynchronous online discussions. Discussion is known to be a critical component of the process of learning regardless of whether learning is experienced in a formal or informal context or within a place-based, blended, or online course format (Al-Shalchi, 2009; Andresen, 2009). Rourke, Anderson, Garrison, and Archer (1999), authors of the community of inquiry model, suggested that the online discussion is a dominant choice for course interactions in online learning when a course is designed to evoke “higher-order thinking” (p. 50). Furthermore, asynchronous online discussions have been known to be an effective assessment strategy in courses since the early period of online learning because they can be designed to promote “high levels of responsive, intelligent interaction between and among faculty and students” while also, due to their asynchronous format, “providing high levels of freedom of time and place to engage in this interactivity” (Rourke, Anderson, Garrison, & Archer, 1999, p. 50). Khine, Yeap and Lok (2003) suggested that design considerations for online asynchronous discussions include the level of interaction and resulting presences afforded because interactions leading to higher levels cognitive, social, and transactional presence are correlated with increased learning and satisfaction in online courses. Havard, Du, and Olinzock (2005) support those suggestions by noting that “many distance-delivered courses experience high attrition rates that result from factors such as students feeling isolated, unmotivated, overwhelmed, or unchallenged, “but this can be mitigated by designs that encourage high levels of interaction and presence through online asynchronous discussions” (p. 134). The literature is firm about the importance of transactional, social, and cognitive presence in online learning as it relates to the online asynchronous discussion. These types of presence are discussed in brief below to provide an introduction to the concepts as a basis for why Ashford University requires online asynchronous discussions in the online classroom. Transactional presence is defined as the “degree to which a distance student perceives the availability of and connectedness with people in his/her educational setting” (Shin, 2003, p. 71). 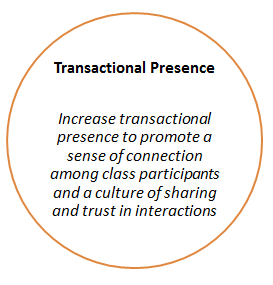 The definition of transactional presence offered by Shin (2003) embodies social presence insofar as “availability” represents access to others through responsive “interpersonal relationships” and “connectedness” is indicated by “belief or feeling that a reciprocal relationship exists between two or more parties, involving an individual’s subjective judgment upon the extent of the engagement in relationships with others” (p. 71). Therefore, the online asynchronous discussion provides an instructional opportunity to reduce transactional distance among course participants by increasing transactional presence. Relatedly, increasing levels of social presence can enhance the reciprocal relationships possible in an online course and thereby enhance the learner’s feeling of connectedness in an online course. 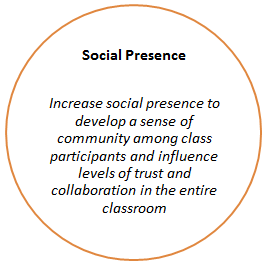 Social presence is characterized by interactions that exemplify interpersonal and affective, or emotional, connections among learning participants (Garrison, 2003; Murphy, 2004; Rourke, et al, 1999). Specific indicators of social presence include interactions, such as “self-introduction, expression of feeling, greeting, closure, jokes, the use of symbolic icons and compliments to others” (Lobry de Bruyn, 2004, p. 77). Interaction among online course participants usually initiates some level of collaboration whereby “participants show awareness of each other’s presence and begin to relate as a group” (Murphy, 2004, p. 422). Furthermore, collaboration is indicative of social presence and the formation of a community of inquiry (Garrison, 2000; Murphy, 2004). Such collaborative communities “not only share perspectives, but also challenge and refine those perspectives” (Murphy, 2004, p. 423). The significance for implementing an effective learning environment through an online asynchronous discussion is that the challenging and refining of perspectives leads to construction of shared knowledge and meanings (Murphy, 2004; Rourke, et al, 1999). Therefore, including asynchronous online discussions is ideal because it provides a space for course participants to develop and enhance social presence in the online classroom. Nevertheless, transactional presence and social presence cannot stand alone; these forms of presence must occur in conjunction with strong levels of cognitive presence. Cognitive presence is characterized by the “process of both reflection and discourse in the initiation, construction and confirmation of meaningful learning outcomes” (Garrison, 2003, p. 4). That is, the design of online asynchronous discussions must aim to promote reflection and forms of collaboration since these are known to be the fundamental ways in which cognitive presence is formed in online courses. Recall, when present, collaboration occurs along a continuum of six stages represented by (a) “social presence; (b) articulating individual perspectives; (c) accommodating or reflecting the perspectives of others; (d) co-constructing shared perspectives and meanings; (e) building shared goals and purposes; and (f) producing shared artifacts” (Murphy, 2004, p. 423). Earlier processes, such as social presence and interaction articulating individual perspectives, are necessary before reaching the highest levels of the continuum, but occurrence of the earlier processes does not guarantee as much since “simple interaction is a necessary prerequisite to full collaboration, but simple interaction may occur without ever moving forward to higher levels of collaboration” (Murphy, 2004, p. 423). In summary, the continuum model of collaboration explained above from Murphy (2004) supports the use of online asynchronous discussions to create a learning experience that goes beyond superficial interactions and increases social and transactional presence lading to community development and cognitive presence, which is known to promote deeper learning of course topics. Though we may not readily think of the online asynchronous discussion as a form of collaboration, they are! To achieve the goal of increased transactional, social, and cognitive presence in our online classrooms use a variety of discussion formats. Garrison, R. (2003). Cognitive presence for effective asynchronous online learning: The role of reflective inquiry, self-direction and metacognition. In J. Bourne & J. C. Moore (Eds. ), Elements of quality online education: Practice and direction (Volume 4). Needham, MA: The Sloan Consortium. Havard, B., Du, J., & Olinzock, A. (2005). The knowledge, methods, and cognition process in instructor-led online discussion. The Quarterly Review of Distance Education, 6(2), 125-135. Khine, M. S., Yeap, L. L., & Lok, A. T. C. (2003). The quality of messages ideas, thinking and interaction in an asynchronous CMC environment. Educational Media International, 40(1/2), 115-125. Lobry de Bruyn, L. (2004). Monitoring online communication: Can the development of convergence and social presence indicate an interactive learning environment? Distance Education, 25(1), 67-81. Murphy, E. (2004). Recognising and promoting collaboration in an online asynchronous discussion. British Journal of Educational Technology, 35(4), 421-431. 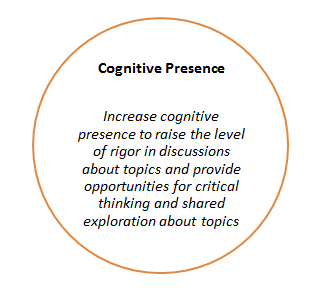 This entry was posted in Educational and tagged cognitive presence, online discussions, social presence, transactional presence by Lisa Johnson, Ph.D.. Bookmark the permalink.